Cop-Guard™ is wood, pressure treated with copper naphthenate wood preservative. It provides fungicidal and insecticidal protection for wood products in ground contact, and above ground uses. It is low in toxicity and can be installed with a high degree of safety. Copper Naphthenate has been used as an industrial wood preservative since the early 1900’s. 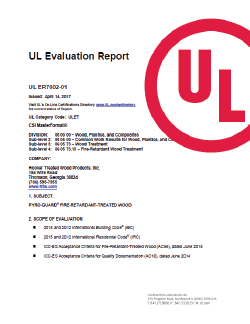 It is listed in the standards of the American Wood Protection Association (AWPA) and is accepted for use by the United States Department of Agriculture and the United States military. Cop-Guard™ treated wood products are available at a range of retentions for above ground use, ground contact and severe exposure. It is effective against mildew, mold, decay organisms and various termites, including the Formosan Termite. Cop-Guard™ treated wood presents minimal health or environmental concerns and has a low mammalian toxicity. Cop-Guard™ treated wood removed from service is not a hazardous waste.